Economic conditions in four Arkansas metro areas remained solid in the third quarter of 2016, with the only negative being slower rates of growth in central and Northwest Arkansas. Compared to the third quarter of 2015, the pace of economic growth was down slightly in Central Arkansas and in Northwest Arkansas, up in the Fort Smith metro, and up in the Jonesboro metro. 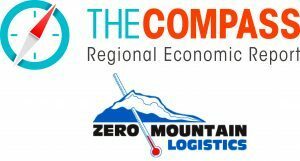 The quarterly Compass Report is managed by Talk Business & Politics, and is sponsored by Lowell-based Zero Mountain Logistics, a subsidiary of Fort Smith-based Zero Mountain Inc. The report is the only independent analysis of economic conditions in four Arkansas metro areas – Central Arkansas, Northwest Arkansas, Fort Smith metro, and the Jonesboro metro. To underscore the impact of the four largest metro areas, for September the unemployment rate for the rest of the state was 4.8%. The statewide unemployment rate with the three largest metros added back in was 3.9%. The gap had been much greater but much of the state, at least in terms of unemployment rate, has improved. For example, the Pine Bluff Metro area unemployment rate (typically the highest in the state) was 5.4% in September. Nonfarm jobs in central Arkansas grew by 0.7% between September 2016 and September 2015, was up 1.9% in Northwest Arkansas, up 0.52% in the Fort Smith metro, and rose 3.1% in the Jonesboro metro. 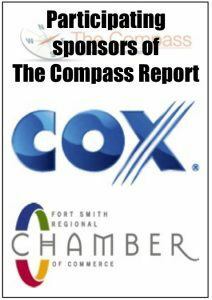 Jeff Collins, the economist for Talk Business & Politics who gathers data used in The Compass Report, said the booming Northwest Arkansas economy continues to lead overall economic growth in the state. Nationally, Collins said the consumer is beginning to show real signs of spending more and having more to spend. 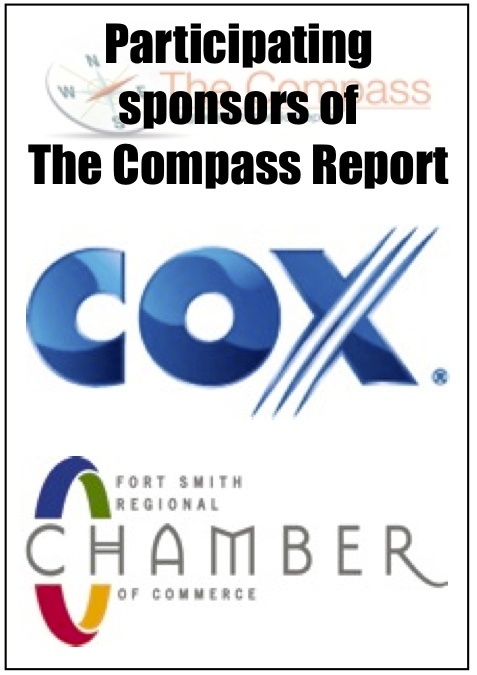 The Compass Report for the Fort Smith area posted a C grade for the third quarter, better than the C- in the second quarter of 2016 and better than the C- in the same quarter of 2015. Helping to drive the slightly better gain was an improvement in the regional jobless rate, gains in regional sales tax revenue and a surprising gain in the number of manufacturing jobs. However, the story for the metro area continues to be slow to muted job growth compared to most other parts of Arkansas. The number of jobs totaled 114,400 in September, just 0.52% more than the 113,800 in September 2015. By contrast, total employment in September 2006, prior to the recession, was 125,426. Regional manufacturing jobs totaled 18,000 in September, up from the 17,700 in September 2015. The Northwest Arkansas area posted a B grade for the third quarter, down from the A- in the second quarter and just below the B+ for the third quarter of 2015. However, the decrease is a reflection of more modest economic growth and does not suggest an economic downturn. The number of jobs totaled 244,300 in September, well ahead of the 239,700 in September 2015. Manufacturing jobs fell from 27,200 in September 2015 to 26,100 in September 2016. Also, the booming tourism industry paused during the quarter, with employment at 24,200 in September, just off the 24,300 in September 2015. “Nonfarm employment grew at a relatively modest rate September-on-September. The metro economy added roughly 4,600 jobs. This was an increase of 1.9%. Given recent quarterly growth rates, third quarter data indicate solid but not the spectacular growth,” Collins noted. Sales tax revenue in the region continues to grow. Collections in Benton, Madison and Washington counties totaled $8.426 million in September, better than the $8.091 million in September 2015. Collins said tax revenue in the region continues to impress, especially when compared with the larger central Arkansas metro. “The Northwest Arkansas regional economy had sales and use tax collections totaling roughly $25.2 million in the quarter while the Central Arkansas regional economy had collections for the same period of roughly $26.3 million,” Collins said. For the third quarter of 2016, the state’s largest metro area posted a C, unchanged compared to the second quarter and just below the C+ in the third quarter of 2015. 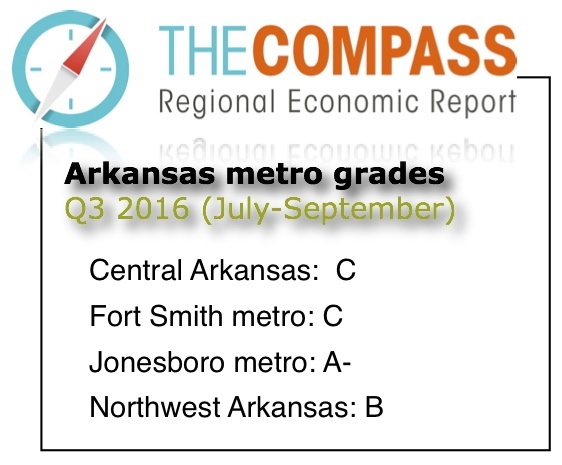 Like it was with Northwest Arkansas, the grade reflects a slower pace of growth than the same period in 2015. The number of jobs totaled 355,800 in September, well ahead of the 353,300 in September 2015. Government services and trade, transportation, and utilities, the two largest sectors of the Central Arkansas economy, both gained employment. September-on-September government services employment was up a modest 200 jobs while trade, transportation, and utilities gained 900 jobs. “Of all the economic indicators, unemployment rates at or near the full employment rate of 4.0 percent stand out. Growth has been solid in the state’s largest metro,” Collins said. The region also continued to see sales tax revenue gains. Regional collections totaled $8.901 million in September, better than the $8.503 million in September 2015. Also, gains continued in the region’s growing travel and tourism industry. Sector employment stood at 34,600 in September, up 1,000 jobs compared to September 2015. The region posted a third quarter grade of A-, unchanged compared to the second quarter. 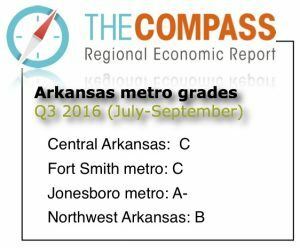 The Jonesboro metro began its first quarter in The Compass Report with a B+ in the first quarter of 2016. Nonfarm employment continued to expand in the third quarter. Non-farm jobs totaled 56,800 in September, up from 55,100 in September 2015. The pace of growth moderated compared to the second quarter. “Non-farm employment continued to expand for the second quarter of 2016. For the second quarter the metro added roughly 1,700 jobs. This was an increase of 3.1%. Growth was off slightly from pace reported in the second quarter (3.4%),” Collins said. Sales tax revenue and building permit values also grew for the region in the third quarter although somewhat at a slower pace than in recent quarters. Sales tax revenue in Craighead and Poinsett counties was $1.97 million in September, just above the $1.835 million in September 2015. The region also posted a significant uptick in building activity, but Collins said the quarterly numbers are not likely part of a trend. “The number of building permits in the third quarter for the Jonesboro metro were up approximately 96% while the valuation of permits was up roughly 48%. The massive increase was due to a large number of apartment units being reported as permitted for the quarter by the U.S. Census Bureau. This is obviously an anomaly and the large number of units should have a dampening effect on future multi-family construction,” Collins said. Link here for the raw data used to prepare The Compass Report for the four metro areas.